Join one of the Sistership racing courses. 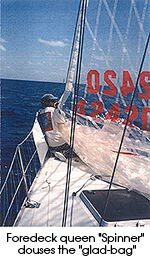 Learn to set, fly, trim and douse a spinnaker and work every position on the boat - foredeck, midboat, sail trim. This course is taught on J33 "Boomerang" and is offered to people who have taken 101-104 with Sistership. Depending on the clinic/event we learn and practice for 5 days then race at the end of the week. Upon completion of this course you be will be able to step on a racing boat and participate with skill and confidence. Prerequisites: good physical condition, agility, sense of humor and thick skin (the last two go hand in hand!). My old friend Nancy "Spinner" Strayer from Seattle is one of the finest foredeck people I have ever sailed with. She travels to the BVI to act as foredeck instructor for the BVI Spring Regatta and The Rolex Regatta. She grew up on a farm in Ohio where her parents still live. Sharing her sailing experiences with her non-sailing family is always a challenge. She shared with me an excerpt of a letter to her folks with the comment "if you wondered what your foredeck instructor was thinking during those long beats at the Rolex......"
"My best description of what I experience from my position as first crewperson on the rail, closest to the bow: First, imagine yourself in a lawn chair sitting in the sun. Except take away the chair back and arms. Tilt the chair back slightly, and drop the ground away so your legs are dangling 4-5 feet above the ground. Now rock the chair side to side and back and forth, in no particular order or rhythm. Still with me? Turn on one of those warehouse fans and point it directly at one of your shoulders, to the side. Imagine it being so cranked up that your hat flies off every time you look toward the fan at the wrong angle (this is why they sell strings with clips on them at marine shops). " " Now rig a clothesline so it cuts across your stomach side to side. Strap a second clothesline about Adams' apple height. (These are the lifelines). Comfortable? How about a 5-gallon pickle bucket of cold briny water thrown directly into your face and chest at least every 5 minutes and always when you least expect it. (And I do this for fun??) Those sitting next to you on the side away from the fan are cheering your efforts at keeping them dry. Now this scenario is only true for the first third of the crew. Those farther back get splashed a little or not at all. This is why I, as foredeck can be seen sporting foul weather gear and knee high boots in July. The driver, who doesn't even hang her legs over, will be in shorts or tennis shoes." This is the sport we all love!